The US consumers spent a whopping $638.3 billion during the 2016 holiday season (Oct~Dec). That’s a $3 billion increase over what the National Retail Federation had previously projected. All trends indicate an even bigger record-setting year in Q4 2017. With Amazon leading the way, E-marketers large and small are constantly looking for ways to be a part of this growing phenomenon. Providing low pricing is no longer enough to attract customers and maintain their commitment at checkout. Free shipping plays a major role in the consumer decision-making process. According to a study by Schindler, Morrin and Bechwait, the consumer had a higher degree of “shipping charge skepticism” and actually preferred the pricing with freight charges included. To take it a step further, simply offering free shipping is no longer acceptable. Especially to the 65 million Amazon Prime members who enjoy free and fast (same day or 2 day) shipping. Consumers are trained/ conditioned to not have to think about shipping cost or minimum order requirements. Wal-mart, arguably the 2nd largest online retail giant is now adapting the “fast and free shipping” idea. However, Wal-mart still has not come up with a competitive solution without charging a similar $99 annual membership fee like Amazon. Therefore, Wal-mart shoppers still have to spend over $35 in order to get free shipping. So, if Wal-Mart can’t do it, how can a smaller size e-commerce adopt “free shipping” to stay competitive? Factor in shipping into offer prices. Promote free shipping and focus on upsells or cross-sells as shipping becomes more efficient as more items are shipped together. Develop a loyalty program where short-term margin lost by shipping may actually be offset by long-term gains. Offer free standard shipping — but provide multiple express shipping options at profitable margins. If free shipping on a single item is not achievable. Offer a “buy 2 or more items” program for free shipping. Offer Free shipping during a pre-determined time frame. 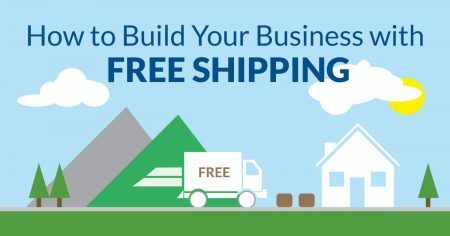 For more information on how to make free shipping work for your business, please contact us Ready Artwork or give us a call at 626.400.4511.